Ah, the wonderful perks of being in a new relationship: you’ve got those butterfly-in-the-stomach tingles, each and every new factoid about the other person makes you swoon with excitement, and nothing about them annoys you…yet. The downside, though? You’re overly conscious about your flaws, which stand on guard, ready to leak out at any given moment. While these can manifest in a plethora of ways, from shyness to your inability to hit a high note during karaoke, your confidence can take an especially brutal hit from surface-level skin issues…like pimples. “My patients often feel that when they have a breakout, it’s all people can see and it consumes their mind,” says Josie Howard, MD, a San Francisco-based dermatologist and psychiatrist. “Our skin and mind often have a very strong connection. 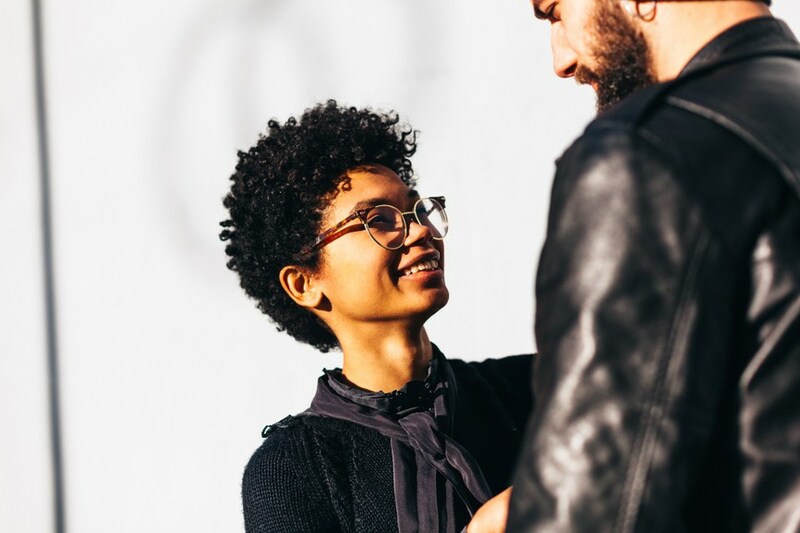 The stress of beginning a new relationship is enough to trigger a breakout, which can then increase feelings of self-consciousness and make one feel guarded during a time that’s intended to be focused on being open with a new, special person.” Too true. The thing is, going makeup-free has become the ultimate rallying cry in the wellness world. It’s a strong act showing your self-confidence, but when you actually put yourself to the test in front of someone new and exciting, it makes you realize how big (not to mention revealing) of a move it can be. I’m personally in the throes of it myself. I’ve met a great new guy, we’ve gone on some wonderful dates…and then the first sleepover comes. I wouldn’t have been so stressed about it if it weren’t for the fact that my chin was in the midst of double header breakouts—monster ones—and staying over would keep me from completing my nightly routine and camouflaging these via gobs of concealer from my new crush. In order to keep this new dilemma from sending me into a spiral of worry, I sought out a psycho-dermatologist (you know, psychologist-slash-dermatologist) to quash my worries and set my head straight. Keep reading to see what an expert has to say—and what can happen when you let your guard down (AKA stop letting pimples stand in your way). In my case, my first invitation to sleep over comes…then goes, thanks to my paranoia about newly forming breakouts. After a lovely evening in which my date and I bar hop, we head to his apartment for some friendly canoodling that lasts until a time that’s better described as early morning than late night. He insists that I stay over and we grab brunch the next day, but with my skin on the brain (I need to wash my face, tone, and put on a retinol to remedy the breakout, after all) I trek back to my apartment and snooze until the next afternoon. You want to put your best foot forward, of course. And that’s exactly why it can be intimidating to wash off your makeup around your new fling, if a swatch of concealer, a sweep of powder, or a dab of foundation makes you feel like the most confident version of yourself. But here’s the thing: Everyone is dealing with an insecurity in some way or another. “A survey, conducted by Abreva, found that 74 percent of Americans would avoid at least one planned social activity such as a date if they have a cold sore,” says Dr. Howard. “A blemish on the skin, of any sort, can have a huge impact on confidence. And that’s a lot of missed dates.” Touché. Trust me—I’m aware that pimples are a minuscule factor in the wide-reaching topic of being in a relationship. There are bigger issues to deal with, after all. But I’m also aware, after talking to my extended network of girlfriends, that my fears of showing my makeup-free skin are real. “If a person doesn’t feel confident about themselves, they’re often fearful of exposing vulnerability,” says Dr. Diller. “So they perform rather than relax, and focus on their partner’s needs instead of their own and tend to be in constant need of reassurance.” In other words: That person doesn’t really act like themselves. This preoccupation can also lead to an unhealthy cycle of insecurity and stress, that can then even make the thing you’re worried about (breakouts) worse. “Trying to look and be your best requires time and energy—which can be exhausting,” notes Dr. Howard. “The last thing you want is a skin condition triggered by stress.” Amen. For the sake of moving forward in finding love, it’s all about treating yourself with compassion—blemishes, imperfections, flaws and all. I’ve calmed down because I’ve realized that I like my new love interest much more than I like stressing out about breakouts. Also important? I’ve never met a pimple that doesn’t go away. So there’s that. If you’re breaking out, here’s your 5-step big pimple plan for covering it up. And these are the best editor-approved natural concealers.